Its now officially summer and its 90 degrees outside with 1000% humidity and we have been getting rain almost every day but that doesn't help at all. This month I found my favorite peanut butter on sale so I got two jars. That got the little hamsters in my head spinning, peanut butter cookies. I don't want to heat up my kitchen with using the oven because of the heat outside. Earlier this month I made Eggless Oreo Cheesecake Cookie Dough and it was delicious. It was chocolatey, creamy, tangy and marshmallow-y. Peanut butter is one of my favorite things to eat. Its gives you a sweet and it gives salty, its almost perfect. Don't they look tasty. Did you know that peanuts have more antioxidants than apples, carrots or beets, peanuts taste much better than carrots or beets. 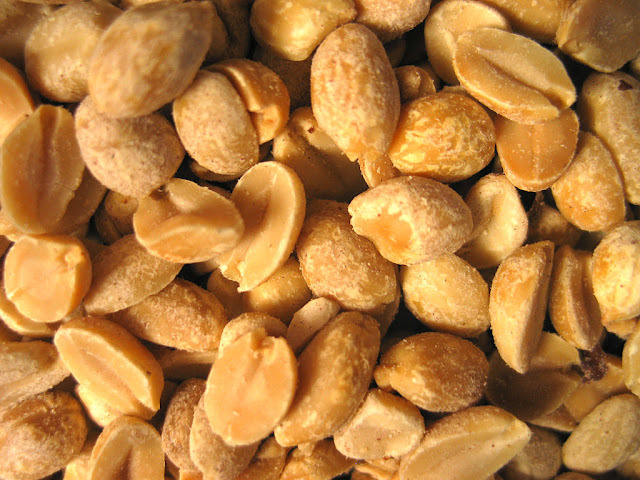 They are full of oleic acid, Vitamin E, niacin, folate, protein and manganese. That is one strong legume and should make you feel great eating it. 8 oz (2 sticks) Unsalted Butter, softened. I used Kerrygold. Cream together butter, brown sugar and sugar for 3 minutes or well combined. Once butter and sugar are well blend add sea salt, vanilla extract or vanilla beans. In a separate bowl combine flour, peanut butter and favorite mix-ins. Cover and let it sit for at least 2 hours before consuming. If dough is still too tight or not creamy add in milk. Interesting, seems yummy & works well for vegan like me.. gonna try out for sure this weekend itself! It totally can be made with vegan butter even coconut oil. I looove cookie dough!!! And this looks so good! And i love peanut butter!!! Oh man, I'm hungry now!!! Well this is a great cookie dough for you. Cookie Dough is life! If you can teach us how to make it with ice cream like Ben & Jerry's you're officialy my God! And your blog is very unique, love it! That sounds delicious and I could add in my favorites. I could eat it just as it is also because it is eggless. How awesome I never thought of that. You come up with some of the most yummy recipes.